Pretty much everyone knows who Mickey Mouse is. But, do you know who Oswald The Lucky Rabbit is? Walt Disney actually started out with Oswald The Lucky Rabbit, not Mickey Mouse. On September 5th 1927, Oswald made his first appearance in Trolley Troubles. (Over a year before Mickey was created) That lucky rabbit was a big star! No one had ever seen a cartoon character that acted like him! Oswald fought bad guys, fell in love, and had many crazy adventures. Oswald had a lot of short films he starred in, and Walt Disney was doing really good! Then, in February 1928, Walt Disney lost the rights to Oswald to Universal! But no, Walt Disney didn’t give up! That… is where our friend Mickey Mouse came along. Can you imagine what would have happened if Walt hadn’t lost the rights to Oswald? Disneyland, and Disney World would have featured Oswald as the star! No one would have known who Mickey Mouse is! Or, Minnie Mouse! Or, Donald, Goofy, Pluto, Daisy… you get it. I mean I would have loved Oswald… but imagining a world without Mickey is hard to imagine. Now, let’s talk about February 2006. An interesting year for Disney. 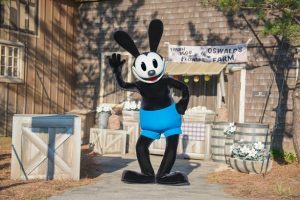 The year Disney earned back the rights to Oswald The Lucky Rabbit. In 2006, the CEO, of Disney, Bob Iger, decided to get back the rights to Oswald. Disney ended up trading, Al Michaels, an ESPN sportscaster for Oswald. Now, Oswald is actually at Disney World and Disneyland sometimes! And, he is now known as Mickey’s older brother who got the spotlight taken away from him. Never, ever, ever, ever underestimate Oswald, because he has had a crazy life! Bottom line is, Oswald will never be able to take over his younger brother Mickey, but don’t forget that it all started with a rabbit. “The difference in winning and losing is most often… not quitting.”- Walt Disney.